Coventry. In 1541 all the foregoing, with the exception of Penley, were transferred to the newly created diocese of Chester. In 1849, apart from Whitewell, the six parishes in turn became part of St. Asaph diocese. Penley would remain part of Lichfield until Disestablishment in 1920. The ecclesiastical history of Penley is further complicated by the fact that until c.1866 it was a chapelry and Perpetual Curacy of Ellesmere, Shropshire, with, for the genealogist, all those problems implied by subordinate status. However, Penley's own registers date from 1752 when the then churchwardens, Edward Dymock and John Randles, purchased a suitable calf-bound parchment book "for the Use of the township of Penley". This earliest general register (Ba 1753-1812, M 1753, Bu 1753-1812) was transcribed, indexed and published in typescript in 1975, as was also (in 1980) the missing register of Baptisms covering the period 1813-72. The latter deficiency was made good from Bishop's Transcripts (BTs) (Lichfield JRO B/v/7 with photo-copies in CHOH NT/521). The BTs themselves are lacking for the years 1847, 1850 and 1864-72, which nine-year gap coincides with the incumbency of Rev. Richard Spoonley. The missing register contained 100 pages with eight entries to a page. If completed a maximum of 62 baptismal entries are unaccounted for over these nine years - a pity really, for up to 1852 there were only ten entries wanting in the transcripts. As 'restored' the register is 91% complete. Both these are being reset to bring them into line with the format of CFHS's published registers. recorded locally. This was possibly die to tightening up of regulations and the realisation that the building was not licensed for marriages (and would not be again until 1866 when the Rev. R. Spoonley himself defrayed the cost of the licence). The Penley Marriage Register recommenced in February 1867. But one should note that in the Ellesmere registers between 1679 and 1749 at least 22 weddings are specifically annotated as having taken place at Penley. marriages - one Penley marriage in 1654, another in 1655 and then a gap until 1671. If not in Ellesmere's registers, the arrivals and departures of Penley folk must have been recorded separately In another book - or does one assume that there were no births, marriages or deaths in Penley over a 14-16 year period, or that over the same measure of time successive vicars of Ellesmere did not differentiate entries relating to their three outlying chapelries? Such was the uncertain state of our knowledge up to June 1995. Then, out of the blue, the CRO, Hawarden, received a photo-copy of two sides of a large sheet of parchment some 11Â½ x 16Â½ins, badly stained in the lower half but for the most part legible. Each side was ruled down the centre and the columns headed "Baptizeings 1657" and "Burials 1659" in the hand of the 'incumbent', with the name 'Penley' in a different hand. It clearly represents the first two pages of an intended general register for Penley: Ba 1657-61 (26 entries), Bu 1659-60 (5 entries) all specified as taking place in Penley. Indeed the very first entry, dated 21 November 1659, is for the christening of one Samuel, son of the 'Minister' of Penley, John Broster. The book was taken away from Penley Church sometime after March 1661 and put to other uses as some sort of 17th century Common Place Book, ending up in London. A more detailed description of the book and its contents is awaited with interest. John Broster is first encountered in Hanmer's 1653-1743 Burial Register (VoI.2/Pt.2 in CFH's published series) where the burial of his elder son Richard is noted on 12 March 1658.
livings. The Rev. Henry Bridgeman was ousted from Bangor in 1646 and restored 1660. The Rev. John Roan of Hanmer was deprived in 1645 after less than year in office. He was no loss being dismissed briefly as 'Though a native of the parish not accepted of the people'! They were replaced with an initially itinerant clergy selected more for their skill as preachers and responsible for a number of congregations. In this they varied little from the pluralists before them and possibly merited the cynical comment 'the sinecure rector makes way for the fleeting preacher'! Post 1653 these arrangements gradually gave way to a settled ministry with ministers being 'intruded' into those places which had earlier served as bases for an itinerant ministry. This explains why in Maelor, instead of just the two multi-township 'ancient parishes' of Hanmer and Bangor, one also finds Presbyterian ministers at Whitewell, Worthenbury and Penley. The date for this would appear to be late 1657 when, for example, Revs. Philip Henry and John Hanmer, who had received the Presbyterian ordination on 16 September 1657, were 'intruded' respectively into Worthenbury and Whitewell. Philip Henry's 'Intrusion' into Worthenbury was aided by the fact that he was domestic chaplain to John Puleston of Emral Hall, Worthenbury, former judge of the Common Pleas, member of many Parliamentary Committees for Flintshire and Denbighshire, as well of the Commission for the Propagation of the Gospel in Wales. He bought the advowson of Worthenbury, and endowed the 'living' with £100 a year and a house. Based on the evidence of the registers, 1657/8 fits in very nicely with the time that the Rev. John Broster is first met with as 'minister' at Penley. In fact Broster would appear to have been installed at Penley before official paperwork confirms the former chapelry's new parochial status. 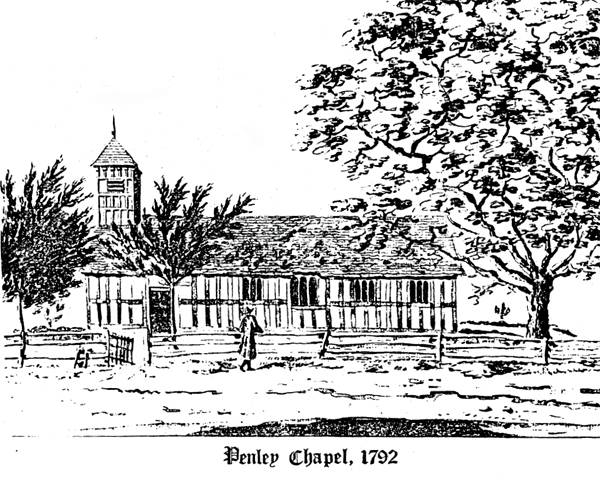 On 12 March 1657, following the recommendation of the Trustees for the Maintenance of Ministers and Division of Parishes, the Council of State formally approved "an augmentation of £40 to the minister of Penley Chapel, co. Flint, within the parish of Elsmeere, co. Salop". Such monies were found from the profits of sequestrated church lands and tithes. But it was not until 1 May 1658 that the Council appended its seal to orders, already put into effect on the ground, for the severance of Penley from Ellesmere and 'to make it a distinct parish'. (Cal. State Papers, 1656-7, 310; ibid. 1657-8, 376). was replaced in 1661 by Rev. Richard Hilton as 'minister' of Worthenbury. But within months, as a restored and rather vengeful Rector of Bangor refused to acknowledge any ecclesiastical disposition made during the Commonwealth and harshly re-asserted the rights of his rectory, Hilton was transferred to Hanmer in the stead of the much loved Richard Steele, minister of that place 1645-62.
restoration of the episcopacy, a curate(s) of Penley continued the tradition for the next eight or nine years until 1668/9, when the Vicar of Ellesmere ordained otherwise!